The orginator of Shirley & Lee's classic "Let The Good Times Roll" and, two decades later, Shirley & Co's "Shame, Shame, Shame". 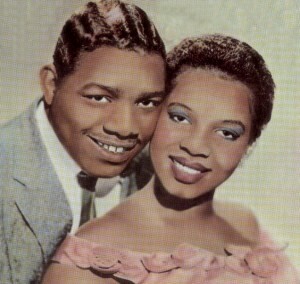 The success of Shirley & Lee helped spawn the R&B duet idiom, highlighted by artists such as Mickey & Sylvia, Gene & Eunice and Johnnie & Joe. Just as importantly, they were one of the earliest R&B acts to be heard in Jamaica, thereby paving the way for the local bluebeat and ska styles, and eventually reggae. Shirley Mae Goodman and Leonard Lee were born just ten days apart in 1936 and grew up in New Orleans' Seventh Ward. One of their friends was a girl named Evangeline, whose parents owned the only piano in the neighbourhood. Every night after school, Shirley, Lee and about a dozen pals would congregate in Evangeline's living room and harmonise. The kids found out about Cosimo Matassa's J & M Studio and pestered him to let them record "I'm Gone", a song they had put together. By chance, Eddie Mesner, co-owner of the Los Angeles-based Aladdin label, got to hear and liked a tape of the song at Cosimo's while in town to audition talent. After tracking down she and her pals, Mesner offered Shirley and Leonard Lee a recording contract. The simple two-chord "I'm Gone" - featuring the band of Dave Bartholomew, the same group that worked on Fats Domino and Smiley Lewis' early Imperial recordings - was an instant smash late in 1952, earning Shirley & Lee the sobriquet, the Sweethearts of the Blues. Other territorial R&B records followed, including "Shirley's Back" from 1953, "Feel So Good" and "I'll Do It" from 1955. In 1956, Shirley & Lee's "Let The Good Times Roll" and "I Feel Good" crossed over into the pop charts. Immediately transformed into the Sweethearts of Rock'n'Roll, they were embraced by the first wave of white teenage record buyers of the 1950s. The cuddly New Orleans duo was tailor made for young consumers of the era, as in trade magazines, and on record, they were the picture of adolescent innocence. They retained their popularity by working through most facets of romance, including break-ups, reunions, revenge, flirting and, eventually, rocking all night long. Each new release was another chapter in their love affair that lasted nearly a decade, but in real life the pair's friendship was strictly platonic. While some dismiss their records as childish and repetitive, their music was undeniably classic New Orleans R&B. Their recordings always included the top-rated local session men, and their material was usually clever and provocative. But eventually the hits dried up and the duo bowed out of Aladdin in 1959. Soon after, Mesner sold his label and publishing to Imperial's Lew Chudd, supposedly to cover his gambling debts. Shirley & Lee then signed with Warwick and had some minor success. In 1962, Imperial's Dave Bartholomew was interested again, but try as he might, he couldn't find a way to make the duo sound commercial. Shirley & Lee finally broke up in 1963, Lee remaining in New Orleans and Shirley heading for Los Angeles, where she found work as a session singer. Her voice can be heard on several albums by Dr. John, the Rolling Stones' "Exile On Main Street" and records by Sonny & Cher and Jackie DeShannon. She occasionally tried to work more duet magic when she cut records as Shirley & Jessie (with Jessie Hill on Wand in 1966), Shirley & Alfred (with Brenton Wood - Wood's real name is Alfred Smith - on Whiz in 1968) and Shirley & Shep. Leonard Lee also cut solo singles for the GNP Crescendo, Trumpet and Broadmoor labels. Shirley was pulled back into the limelight by another veteran of R&B duets, Sylvia Robinson - of Mickey & Sylvia fame. During the late '60s, Robinson founded the All Platinum label in New Jersey. She recorded new artists and tried to resurrect such veteran R&B acts as Donnie Elbert, Dave "Baby" Cortez, Billy Guy (of the Coasters), Derek Martin and Lonnie Youngblood. In 1974, Robinson crossed paths with Shirley, who was working out of music at the time. She was invited to the East Coast to cut the vocals on a disco record. The song, "Shame, Shame, Shame" as by Shirley & Co., was a huge hit the next year. In 1976, Leonard Lee, who had become a social worker, died of a heart attack, aged just 40. By the time the '80s rolled around, Shirley had returned to New Orleans and was no longer performing secular music. In 1988, she won a federal court judgement that granted her a half share of the writer's royalties from "Let The Good Times Roll", which was beginning to generate tremendous royalties. However, Leonard Lee's widow and daughter relentlessly appealed the decision. In 1994, Shirley suffered a stroke and soon after moved to California to be with her son. She died on July 5th, aged 69. Shirley Mae Pixley, nee Goodman, singer and songwriter: born June 19th, 1936 - died July 5th, 2005.